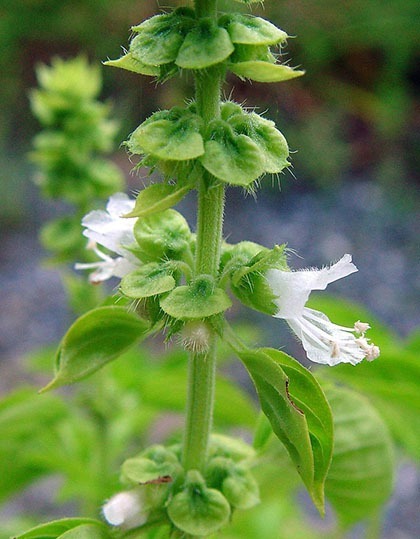 Ocimum basilicum (Niazbo) is a tender plant, best known as a culinary herb which belongs to family labiatae (Mint Family). Most of the herbs belongs to this family are angular stem, leaves simple arranged opposite decussate manner, aromatic glands, Inflorescence verticillaster, complete flower, bisexual, zygomorphic, hypogynous, bilibiate stamens, didynamous epipetalous, carpels two ovaries, fuse. Fruit, schizocarpic. The important genera are Ocimum basilicum, Salvia officinalis, Mentha sylvestris (Podina), Ocimum sanctum (Tulsi), Thymus (Ajwain) etc. An annual, cultivated aromatic herb. The Stem is Herbaceous above woody below, erect, quadrangular, ridged, branched, hairy. Ramal and cauline, opposite and decussate, exstipulate, petiolate, simple, venation reticulate unicostate, hairy, aromatic. Ebracteate, pedicellate, Complete, Zygomorphic, Bisexual, Hypogynous, bilabiate. 5 sepals, gamosepalous, bilabiate, upper lip one lobbed lower four lobbed, inferior, violet green. The Gynoecium is Bicarpellary, syncarpous, Ovary: superior, bilocular and then quadrilocular due to formation of false septum, Placentation: axile Stigma: bifid, A honey secreating disc at the base. Tubers of stachys are edible; leaves of Mentha viridis and Ocimum basilicum are used as condiments. Medicinal drugs like peppermint and thymol derived from Mentha piperata and Thymus serphyllum; leaves of O. sanctum, the sacred plant have some medicinal value, those of O. kilimands-charicum contain camphor and are cultivated for preparing camphor. Seeds of Ocimum basilicum and Salvia aegyptica are used in making poatice for boils etc. Many plants contain abundant volatile aromatic oils, such as thymole (Thymus), Lavender oil (Levendula), Rosemary oil (Rosemarinus) etc. 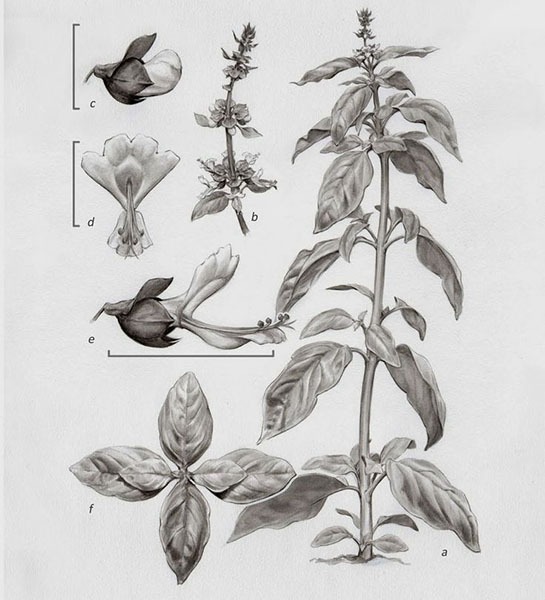 Some species of Salvia (sage) such as S.coccinea and S. officinalis are cultivated for their beautiful scarlet-red flowers and Coleus for its variegated colored leaves.